Whats the range of ages as an artist. Whos the youngest with a "successful" pack. Whos the oldest? Well, I don't know, but it seems to me that the really "successful" packs have been made by adults. If you think about it, I believe you'll come to the same conclusion. I think the success rate decreases with age for a couple of reasons. First, to be a good texture artist, you have to be a decent artist in other areas. There's nothing magical about textures where you don't need to know something about shading, colors, shapes, techniques and so forth. Second, adults just tend to have more time on their hands (or at least they have more control over it,) and they have more resources available. Of course I'm not saying that a pack made by a teenager/kid can't be successful, I've seen many that have been; I was just relating my observations. It's hard to tell because so few people actually fill out their profile information, but I know Pixel Perfection is popular, and Sheep is 19, technically a teenager. I know there are others though, and it depends on what you define popular, or "successful" as. I'm 29, if you want to factor that into your calculations anywhere. But I don't really think it's so much that adults have more free time, in fact most adults have substantially less free time. We just don't have parents lording over us playing the stupid parent mind games like "Why are you wasting all your time doing something I don't understand? Obviously if I don't understand what you're doing it's stupid, so you shouldn't be doing it!!" It's a flawed parent logic I think most kids have to deal with when their parents are too immature to raise healthy kids. But it affects the kids ability to do things like a full texture pack because their parents won't allow them the time to work on their skills, they'd rather see them doing something "more valuable" (ugh..) like play Football or something else equally as meat-headed. Creative skills? Who needs that. Just be a dumb meat head jock like everyone else right? The other factor is the simple fact we've just been around longer, so we've had a lot more experience with our hobbies. So most of the time someone who has been doing digital artwork for 15-20 years (like me) just has had more raw experience than someone who'd only 14 or 15 years old. That's not to say you younger guys/gals can't make artwork on my level (or any of the other adult's level) it just means I've had more time to learn! It's all just speculation though, I think it really just boils down to more experience. No wai. That's just. No. You can't be that good at 10. He didn't make Deferia, if that's what you're thinking. I'm closer to 40 than 30. It takes to very long to make a texture pack, that while many are started by kids, the artists are adults by the time the pack is finished enough to be successful. Since everyone is throwing their ages and most significant pack names out there, I'm 16 (well, exactly one month from 16), and I made Definitance. It has a "popular" gold sticky star, but I wouldn't call it successful as far as resource packs go. Among the other factors in adults having a greater success rate, I would assume the most substantial reason to simply be experience. Adults have been around longer, and as such have seen and interpreted more visual patterns that help to make textures look right, knowing where shadows and light should be, etc. In addition, a greater percentage of adults would have a more realistic look on textures. With these together, adults who come here generally are more likely to have a successful pack than a teenager, and similarly, a teenager would have a greater likeliness than someone younger than that. But despite this, it is only statistically speaking, and I'm sure there are resource packs somewhere made by a teenager that match the popularity of adult's packs. Looking at the resource packs before their creators now, the three most well known packs (by my own understanding) would be DokuCraft, Sphax, and Vattic's Faithful. Some runner ups would include Misa's, LB Photo Realism, and JohnSmith. All of these are made by adults, and are arguably the most well known packs. So this also shows a trend. I am 14 but I would not say my pack is really... popular. Probably due to its crap name and my tendency to forget about things. Meh, it still looks good. Im 15 but I'm not sure when to call a texture pack successful or not. But going back to my older textures I notice some stuff that doesn't look right. I would say atleast 300 downloads per month would be popular. Didn't Dinnerbone tweet a screenshot of him using your pack a few months ago? I'd call that pretty successful. I think that another thing that has a lot to do with a pack's success is the artist's willingness to put in the time and dedication. I've seen a lot of artists from all age ranges give up, because they didn't put in the time to finish a pack, or to develop their skill enough to make it any good. But I've seen a lot of other artists from equally diverse age ranges have very successful packs because they took the time and the effort to develop their skills and actually do all the work. Take for example (and I'm honestly surprised that no one has brought him up yet) Peyton. They guy's only 14, and look what he's accomplished. Another example of practice/dedication vs. time/experience/just more free time: me (which is not to say that I think my pack is any sort of successful yet; I'm more of a crappy-bucket-fill-turned-actually-kind-of-good success story or something). I'm only 17, and I never picked up a brush in my life before maybe 1 1/2 years ago. I was pretty sucky then, but I practiced a lot (like, a lot a lot) and I've improved quite a bit, if I may say so myself. 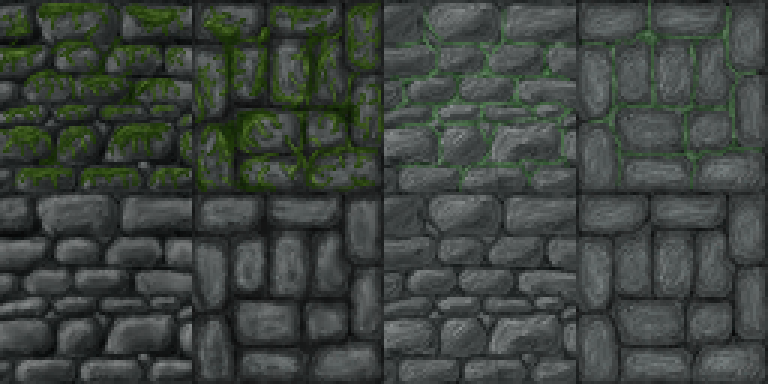 On the left is the first stone brick texture I ever made, and on the right is the one I made earlier this week. EDIT: And this sort of improvement is still going one. Double case in point: left is last weekend, right is five months ago. And, slightly more on-topic, all the packs you mentioned as being the most successful (except Steel's packs, Chroma Hills, Glimmar's, and Derivation; those were all made by a single, very dedicated person) are so because they were introduced early on in the game's history, gained a large following, and have a lot of community backing. If it were just one person doing all the work, they probably wouldn't have the same level of success. It takes a lot of work to get something like that running, which may be why it seems that only adults have that kind of situation surrounding their packs. In my experience, a lot of what adults have that younger artists don't isn't necessarily talent or experience... it's patience. It's really hard to find a kid who has enough concentration to sit there and stare at a screen for an hour to do a single texture. Even rarer are those who can not only do that, but then do it a few hundred more times to actually make a pack. Alvoria: "OK, the first thing you do is double-click here to open the program." Kid: "Can we do something else. I'm bored." Alvoria: "But you said you wanted me to teach you how to do thi...."
I'll be honest, the amount of people in this thread who are awesome and yet still under legal drinking age both astounds me and simultaneously makes me less completely terrified of having offspring of my own. I'm serious about that, by the way. Big "Thank You" to each and every young artist we have here! I would say your standards are charmingly low. However, it's always been my opinion that someone is a success when he or she believes him or herself to be a success... so who am I to judge. Oh, and btw, 30-year-old checking in. No really I am not lying.